In partnership with colleagues whom have established relations both with the Shingle Springs Rancheria and the Sierra Native Alliance, ancestral youth, ages 11-17 join us for a 3 day backpacking trip. 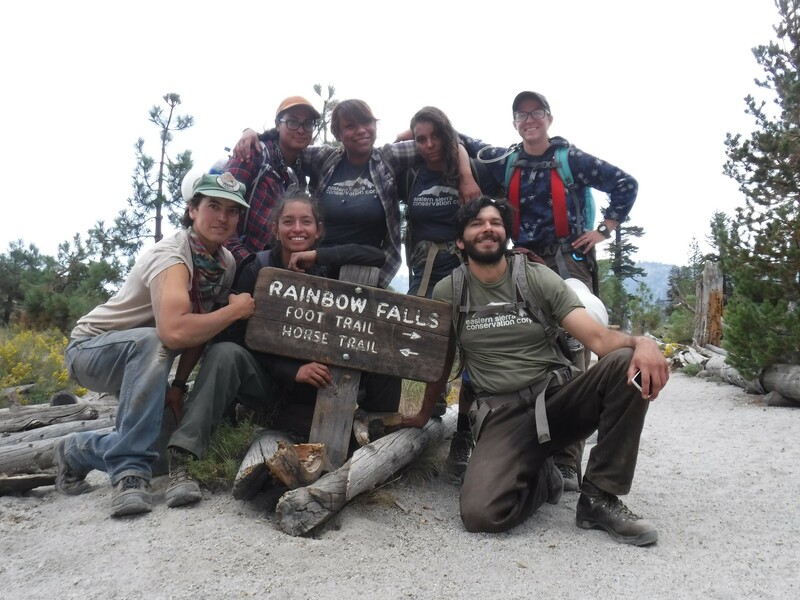 The ESCC SEKI-CC (Sequoia and Kings Canyon National Park Conservation Corps) is a partnership with the Sequoia Parks Conservancy and the National Parks Foundation to incorporate youth corps to live and work in a National Park during the summer season. Young adults serve for 8 weeks working with a variety of National Park departments and gain valuable experience in trails construction and maintenance, invasive species removal, buildings and grounds, and law enforcement for exposure to a number of different NPS positions to facilitate learning about positions they may be interested in. Crews work in both front country and backcountry wilderness settings. In 2017, ESCC provided a women’s specific crew, the first ever all woman crew to work within Sequoia and Kings Canyon National Park. Our WILDlands (Wilderness Immersion Leadership Development) Technical Crew assembles crews comprised of conservation corps alumni, ages 18-30, who desire to advance in the field of land management. Members are given an opportunity to learn and focus on improving skills to better prepare them for crew leader positions whether for conservation corps agencies or state and federal agencies. Crew work is trails focused and projects are expressly technical often involving dry stone masonry and specialized equipment such as grip hoists, chain saws, cross-cut saws, pion jars, rock drills, etc. Off the grade, members focus on developing their own crew leader road maps by designing project logistics, curriculum plans, food menus, and member development outlines. Under the guidance of a crew supervisor, members rotate leadership both on the trail and in camp and receive valuable constructive feedback from their peers.